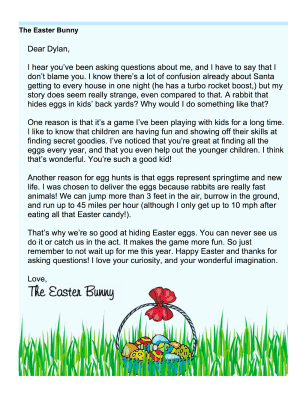 Use this free, printable letter from the Easter Bunny to answer the questions children have about rabbits and eggs. I hear you've been asking questions about me, and I have to say that I don't blame you. I know there's a lot of confusion already about Santa getting to every house in one night (he has a turbo rocket boost,) but my story does seem really strange, even compared to that. 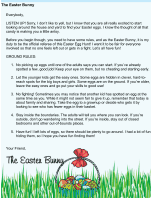 A rabbit that hides eggs in kids' back yards? Why would I do something like that? One reason is that it's a game I've been playing with kids for a long time. I like to know that children are having fun and showing off their skills at finding secret goodies. I've noticed that you're great at finding all the eggs every year, and that you even help out the younger children. I think that's wonderful. You're such a good kid! Another reason for egg hunts is that eggs represent springtime and new life. I was chosen to deliver the eggs because rabbits are really fast animals! We can jump more than 3 feet in the air, burrow in the ground, and run up to 45 miles per hour (although I only get up to 10 mph after eating all that Easter candy!). That's why we're so good at hiding Easter eggs. You can never see us do it or catch us in the act. It makes the game more fun. So just remember to not wait up for me this year. Happy Easter and thanks for asking questions! I love your curiosity, and your wonderful imagination.